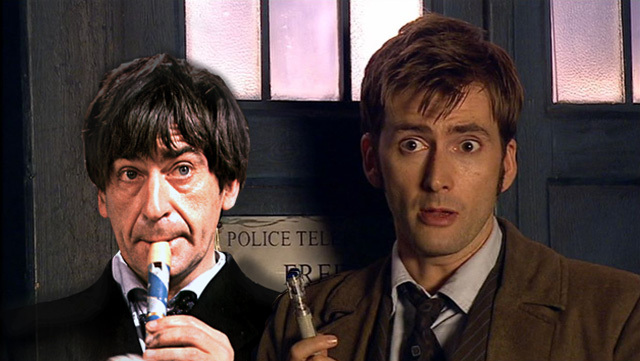 Doctor Who: From Troughton To Tennant | Warped Factor - Words in the Key of Geek. Christopher Morley finds Two in Ten. 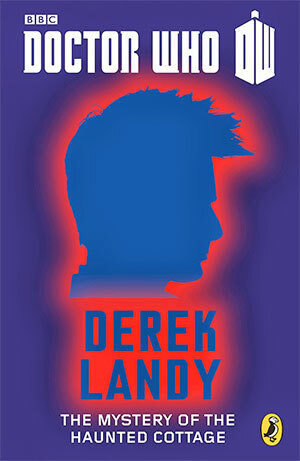 As part of our ongoing Tenth Doctor celebrations, let us consider The Mystery Of The Haunted Cottage, Derek Landy's contribution to the 12 Doctors, 12 Stories anthology - featuring the Tenth Doctor alongside Martha Jones in a pairing which had graced the New Series Adventures line from Sting Of The Zygons up to The Many Hands. While Landy's story is clearly set in a universe which takes its cue from Enid Blyton, whom by this point the Doctor has met as implied early on, there's more than a touch of The Mind Robber about things, too. 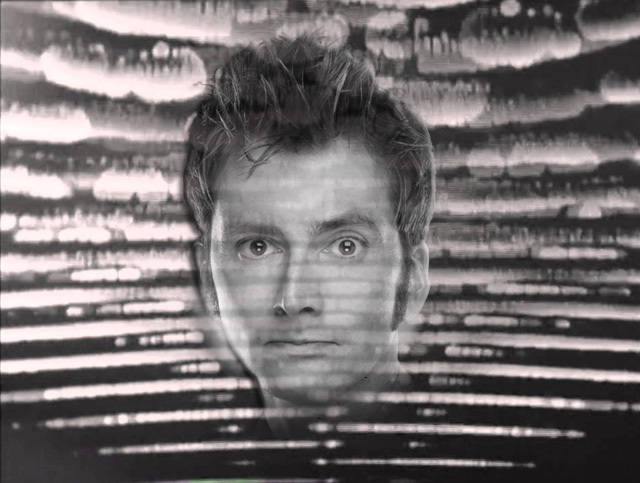 The TARDIS being drawn into a place outside of normal time & space where fiction is reality? Oh yes. An external force working to control that space? Again, quite correct! "If we move outside the TARDIS, we step into a dimension about which we know nothing. We should be at the mercy of the forces outside time and space as we know it." But where the Second Doctor had to contend with the Master Brain & its human servant, the Master of the Land, during a trip to the Land of Fiction with Jamie & Zoe in tow, events in this new Famous Five-ish pocket universe are being manipulated by the Ch'otterai, which has initially cunningly inserted itself into the adventures of the Troubleseekers, a series of books Ms Jones read as a young girl, as the character Mr Cotterill. It seeks escape from this twee romanticised vision, though, and wants to get its mitts on the TARDIS in order to do so. If that sounds entirely dismissive of The Mystery Of The Haunted Cottage, it is by no means intended to. However, it does act as a springboard to many surprising but nonetheless interesting connections between the man Martha knows & unrequitedly loves, as hinted at in The Shakespeare Code, and the little fellow he was who'd loved nothing more than a good tootle on his beloved recorder. Rather nicely the two episodes of the Tenant era, well, a one & a two-parter, which share direct links back to Troughton's time sit next to each other in the Series Three running order! Gridlock reintroduces the Macra as last seen in the self explanatory The Macra Terror. GENT: What are those shapes? GENT: What the hell are they? They've got a bit complacent since last they met the by now suited & long coated Tenth Doctor, when he was a lot shorter and the sonic screwdriver which now ubiquitously lines his pockets was a long way off. DOCTOR: The Macra used to be the scourge of this galaxy. Gas. They fed off gas, the filthier the better. They built up a small empire using humans as slaves and mining gas for food. GENT: They don't exactly look like empire builders to me. DOCTOR: Well, that was billions of years ago. Billions. They must have devolved down the years. Now they're just beasts. But they're still hungry and my friend's down there. After the comparative doddle of resolving the universe's longest traffic jam, time to nip to Manhattan and renew acquaintance with the Daleks. Turns out they're revisiting an old idea, from The Evil of the Daleks, as part of a bid to bring about their evolution, Sec having realised progress must be made before ultimately paying the price for his big ideas. ...The Tenth injecting the Human Daleks with enough spirit to retain something of themselves. MARTHA: They're not firing. What have you done? DALEK 3: You will obey. Exterminate. DALEK : Daleks do not question orders. DALEK : You will stop this. 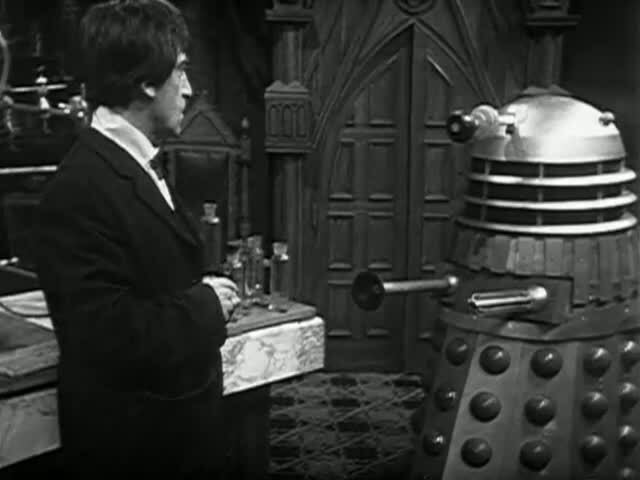 DALEK : You must not question. FOREMAN: But you are not our master. And we, we are not Daleks. In an interview for the Second Doctor episode of the Doctors Revisited series, David would later hail Pat's portrayal of the Doctor as something of a template for all who came after. "Patrick Troughton created the Doctor as he is now. William Hartnell created something that was unique and brilliant but, actually the Doctor we recognise today is much more Patrick Troughton's Doctor. We've all sort of done our version kind of how Patrick Troughton did. He gave the show a way to keep going, he allows it to still exist." "If Patrick Troughton didn't play the Doctor so comfortably and with such charm, and so brilliantly, I don't think I'd be sitting here today."